Contents: Eggo Waffle cereal, giant graham cracker Goldfish, orange juice, milk. Notes: Cereal is perhaps the most common breakfast eaten in the USA. That particular cereal doesn't look to healthy though, as far as sugar content is concerned. Aww school breakfast! 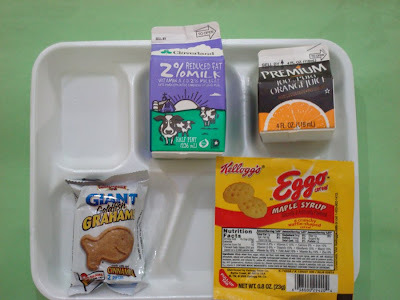 My elementary school had the best school breakfast. Their baking powder biscuits and honey still haunt my dreams. You had the choice of hot or cold breakfast items. Hot items were small pancakes or waffles, french toast, oatmeal, scrambled eggs, etc. Cold items were single serving cereals like in the picture but we only had Cheerios, Golden Grahams, Cinnamon Toast Crunch or Chex. Plus sliced oranges or apples. I never got to school on time to eat school breakfast. I was always tardy.